1. 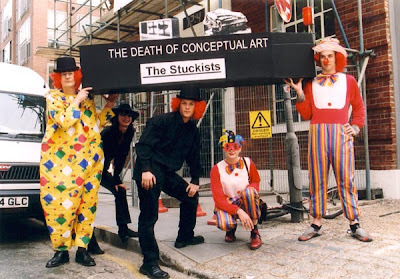 The Stuckists are anti-anti-art. 2. Conceptual art (and its parochial manifestation as Brit Art) is based on and justified by the art of Marcel Duchamp. 3. The art of Marcel Duchamp is not art. It is anti-art by intent and effect. 4.To justify anti-art there must be the existence of art. 5. Duchamp's work was a protest against the stale, unthinking artistic establishment of his day. 6. Today's art is anti-art. 7. Today's art is not art. Its working methodology is to think of something which is not art and to call it art. This is exactly Duchamp's ideology. 9. The great (but wholly unintentional) irony of Post Modernism is that it is a direct equivalent of the conformist, unoriginal establishment that Duchamp attacked in the first place. 10. The principle of anti-art is meaningless in the absence of art to be anti. 11. The only viable innovation today is the true Duchampian path of anti-pretentious, self-congratulatory, claustrophobic, talentless artistic conformism, e.g. the Saatchi Gallery. 12. The Stuckists are the true inheritors of the spirit of what needs to be done. 13. Anti-anti-art is for art. Hi, Angela, & thanks for raising the "anti"! BTW, I added a link to your Continental Review piece on my earlier post about Captcha poetry. billy childish makes great music, raw rock, i still have a few of my old Thee Headcoats records, but his output has been impossible to keep up with, & so many books! -- his woodcuts are awesome. Billy Childish indeed rawks, though his rock is somewhat anti-art itself...it's postmodern in its recycling of garage rock ethos, punk in its attitude and dyi, and pop in its structures. Is it all a big quotation? I dunno, but you can dance to it. By those standards, trying not to offend, what is art? Anti-art is art that is meaningless and is supposed to bring beauty out of the norm... than what is art? I'm quite lost and I am interested in anti-anti-art... but I just don't understand? could you help? About Bunting's Persia: Guardian Book of the Year, 2012 and Paris Review staff pick! DS on... truth and beauty?! Don Share on Obama, Bunting, Persian poetry, and the economy! Copyright Don Share, but steal whatever you like. Simple theme. Powered by Blogger.